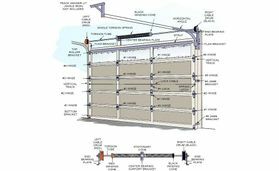 Overhead Door & The Door Store offers a full line of replacement parts to repair your existing garage door and garage door operator in Alberta or southern Saskatchewan. For your convenience, our knowledgeable and highly trained service technicians in Medicine Hat are available 24 hours a day for emergency services. We have parts in stock at all times and you can pick them up at any time. There is no need to book an appointment. Just visit our storefront for parts. We service all of Southern Alberta, so contact us today! Do I need maintenance services for my garage door? Shifting slabs can cause the door to become out of alignment causing greater wear on the moving parts. Moving parts require adjustment over the usage of the garage door over time. Call Overhead Door & The Door Store to schedule an annual inspection and maintenance call. Our service staff works to ensure your garage door remains trouble free for the life of your house or business. What do the steel gauge numbers on a garage door mean? A steel gauge indicates the thickness and strength of the steel used to manufacture your garage door. A lower steel gauge number indicates a thicker steel which is also stronger. In this case, lower is better. However, some garage doors have two thinner gauge skins with an insulated core between them. Such an insulated door can be stronger than one made of a single skin of thicker gauge steel.